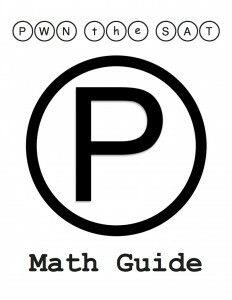 The PWN the SAT Math Guide is now available! UPDATE: The second edition of my Math Guide is now available for purchase at Amazon.com! Read up on the new edition here. The first edition is now out of print, although some residual copies might be available for a while. The rest of this page serves as an archive and will no longer be updated. Maybe your favorite local bookstore, which can order it for you even if it doesn’t regularly stock it. Bring in these ISBN numbers and people who work there should know what to do. You might even be able to get your library to buy a copy, which would mean you could read (but obviously not write in) the book for free! Give your librarian those same ISBN numbers. List price: $10π, but prices vary by retailer. Practice questions: ≈230 (≈150 in the chapters, 78 in the diagnostic drills). The Blue Book Breakdown shows you which technique to use for every math question in the Blue Book‘s practice tests. Each drill question has a handwritten explanation. Wanna see for yourself? Take a stroll through the book at Google Books! For another way the book can be used, read this post about an alternative study plan utilizing this guide. 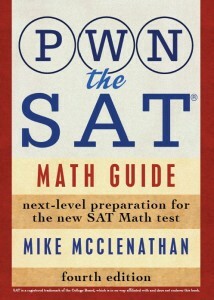 The PWN the SAT Math Guide was created to help ambitious, highly motivated kids maximize their SAT math scores. It contains healthy doses of test-taking strategies, mistake-minimizing techniques, and actual, honest-to-goodness math. Inside you’ll find short, specific drills for all major SAT concepts, and longer diagnostic drills designed to identify weak areas. Solutions for each drill question are worked out by hand. You’ll also find question-by-question breakdowns of the 10 tests in The Official SAT Study Guide (AKA The Blue Book), both by test (so you can brush up on appropriate techniques for the questions you miss) and by concept (so you can see all the myriad ways the SAT might test your knowledge of say, right triangles). If you read this book from beginning to end, with a pencil in hand and a calculator and Blue Book by your side, then you will be able to approach the SAT with confidence, knowing that very few questions will surprise you, and even fewer will be able to withstand your withering onslaught. Stand tall, intrepid student. Your destiny awaits. Wow! Great job Mike for finishing the book before 2012 :D.
One question: will beta testers of your book have access to the final book on Google Docs? Just ordered mine. Can’t wait to see it! Yesss. I can’t wait for you to see it either! Is there still a pdf version available? I have no issue with the price, but a hard copy isn’t my first choice. Eventually there will be, but I’m not set up for that just yet. Let me know if I’ve annoyed you yet (by pushing for a “yes” when you’ve clearly already said “no”). It will be a personal best for me for time, I think. Not something I aim for, but you might as well acknowledge a milestone when it happens, I think. I could do the Beta thing, but you wouldn’t have the capability to print, or save a PDF yourself. You’d just be able to read it in Google Docs. I realize that’s not optimal, but it’s a possibility I’ll explore because you’ve been persistent. 🙂 Email me (mike@pwnthesat.com) if you want to do that…we don’t need to hash out the details in these comments. I was just wondering if I master or get thorough with each and every questions of Blue book ,will i be able to get above average score on SAT 2012?????????? Above average is above about 500 in each section. If you can do every question in the Blue Book, I’d say you’re in decent shape. Thanks again, Jon, for a very thorough review. I’m so psyched that you like the guide. Dude, great job, Mike. As a fellow SAT/ACT tutor, I’m going to require my students buy your book. n00b? I think not. Let the PWNing begin. Quick question – did you create the example problems yourself (or have students/others create them), or are they officially licensed questions from Collegeboard/ETS?P.S. When are you coming out with a Reading and Writing section? Thanks! Contact me via email for a discount code if you plan to buy a bunch of them. I wrote the questions myself, but most of them were closely modeled after CB question types. A few of them are more of a stretch, but exercise the same muscles. You won’t, for example, ever see a question about dice on the SAT, but I think dice are a nice way to practice probability so one of my hard probability questions has dice. Oh bummer. I made it available “worldwide” but I guess Google Play doesn’t have distribution set up in every country yet. Thanks for ordering the book anyway—I hope you like it! You are everywhere, Abhijit! Way to rock! I have been going through the blogs and ordered my book (can’t wait). Usually I blank out of 3 of the questions and make minor mistakes in the process of the other questions. Will this book help me get over that and get to that 750+ range? I usually score in the high 600s (with simple mistakes) and around 740s without my simple mistakes. Dear Mike, I really appreciate your contribution to the SAT preparing community. I’ve read some of your guides and find them conducive. I am interested in buying your SAT Mathbook. However, it seems that Googleplay is “unavailable in” my country, South Korea. I was wondering if you have an alternative method? Personally, I would prefer the paperback edition but will take the ebook if its the only option that I have. Thanks so much for your kind words. Making the guide available everywhere people want it has been a huge struggle for me. It is available through Amazon Japan, but I don’t know how quickly it ships or anything like that. There’s also the possibility of a store in your city ordering the book from the publisher. If you provide them with the ISBN, they should be able to do that. I don’t know how quickly it would arrive, or how much they would charge you, but maybe that’s an option. If neither of those work, send me an email (mike -at- pwnthesat.com) and we’ll see if I can find a way to just ship you one and you and I take care of it via PayPal. Hello Mike, I am wondering if the mistakes I make are normal. I just did your drill number 3 and although I knew how to do every problem i made several mistakes (like for number 11 I got 8 pi and subtracted 16 or on number 10 I knew that I had to figure out each percent but assumed that CB wouldn’t make it that hard and just chose the biggest increase and on 15 I counted 4 kids instead of 5 so that messed up the question and on 17 I added p and r instead of mult. for some reason, etc.). I find that I often make the type of mistake where I immediately know the plan of action to take but then decide that college board wouldn’t make me do all that and just choose the answer that looks right or that I add instead of multiply for some unknown reason. I can’t order your book on Amazon until Wednesday I guess but I am wondering if I can stop this silliness after three months of studying from your book? Thanks for buying the book! You bring up an interesting point, because sometimes the instinct to pause before you go down a crazy rabbit hole and think that the question probably doesn’t require such arduous work can be a good thing. So you shouldn’t surrender that impulse entirely, you just need to get a slightly better sense of when a question will require some rigor and when it won’t. I think 3 months of practice might be exactly what you need to start to internalize that sense. Hello Mike, do you plan on creating a guide for reading or writing? It would be awesome if you do! Thanks for asking. 🙂 One never knows what the future might hold, but I don’t have anything imminently on the horizon. (50-52)/54 questions right on the practice tests, where prior to reading the book I was getting around 44. I would definitely recommend this book to anyone and it has gotten me excited about taking the SAT this October. This is basically my favorite comment of all time. Thanks so much for leaving it. Will there be Kindle version of the book (it would be really helpful, as Google Play is no option for me)? If I recall correctly, there were some problems with amazon kindle store, no? Suppose 4x = 6y. What is the ratio of x:y? And all the little Joe Bloggses think “Well, 4x = 6y, so x:y must be 4:6. That simplifies to 2:3!” Then they see 2:3 in their answer choices, feel warm and fuzzy, bubble it, and get it wrong. What I do is say “Okay, so plug those numbers into x and y. What happens?” Soon they write 4×2 = 6×3, and are bewildered because they were pretty sure 8 doesn’t equal 18. Then I tell them that in reality, the answer is 3:2, quite the opposite — 4×3 does in fact equal 6×2. I show them that if you set up the proportion x/y = 3/2 (because ratios are just fractions!) and cross-multiply, they end up with their 2x = 3y, which is the same as 4x = 6y when you divide both sides by two. So how not to fall into this trap? Two possibilities. First of all you could memorize that trick. Second option is algebraic manipulation. Since we’re asked for x:y, that’s the same as x/y, so if we can get one side to look like x/y the other side is the right answer. A bit of simple division does the trick. Just thought you might like the extra tip! Thanks for the kind words! This comes up pretty much every time I work through the “class of p students has an average test score of 70…” Blue Book question. Great tip.